With so many tasks to get done, how do you decide which ones to do and which ones to do first? This is a common dilemma of a busy person and one who works long hours. If you are overwhelmed with tasks and need a method and routine to prioritize them, then read on. If you have a habit of not completing your To Do list you can benefit from these 4 easy steps to finishing every single task on your To Do list every single time. These steps are related to a proven method for identifying tasks and prioritizing them. Setting priorities is all about ranking the right things in order of importance and urgency. Often time, a To Do list is full of tasks that shouldn’t even be on there. It doesn’t matter how well you perform a task, if it isn’t the right task for you to do, than you are wasting your time. Just because something needs to be done, doesn’t mean you have to be the one to do it. Furthermore, spending time on the wrong tasks is frankly unprofitable. Being effective means to complete tasks that align with goals and responsibilities. Being productive is to complete those tasks on time, with quality, and with minimal effort. Setting priorities, determining what to do and when to do it, is a skill that will help you become effective and productive. If you adopt a method for prioritizing your tasks, you will be able to rid yourself of unnecessary tasks and have time for leisure and fun things. 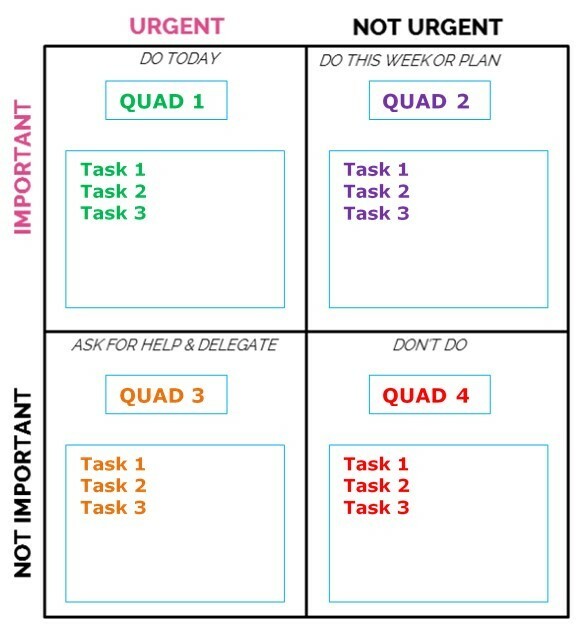 One popular method for prioritizing tasks is known as the Eisenhower matrix. Dwight Eisenhower used this method to set priorities for his schedule. As a productive president who implemented large programs such as NASA and the Internet, I think that qualifies him as an expert on setting priorities. Step 1 – Identify the What. List all tasks on Post it Notes and answer the following questions about each tasks: What’s the deadline? How important is it? Why does it need to be done? Who is really responsible for doing this task? Who else could do this task? I would suggest separating your personal tasks from your work tasks. You can do a separate grid totally or group them in sections on the same grid. Step 4 – Schedule tasks for the week. 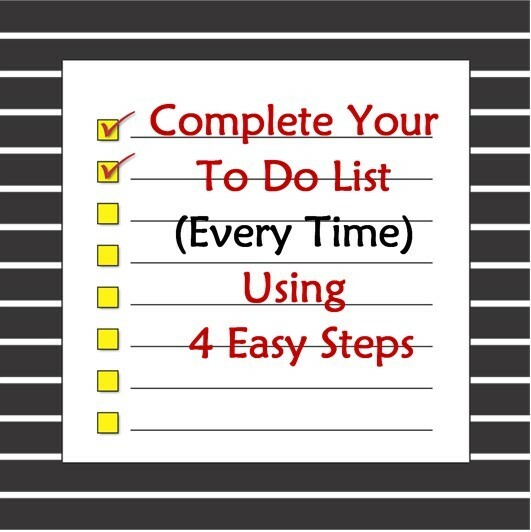 Place the tasks classified as important on your daily & weekly schedule. Bam! You’re done. Now you can focus on accomplishing things that are necessary. Anything else is secondary to these tasks and should not interfere with the ones listed. Don’t try to fill up your day or week with loads of tasks because something important and urgent may pop up later in the week and you can use that time to treat yourself. I love this article. I am always looking for ways to be more productive both in my personal life and my work. Thanks for this great strategy. It seems like it will be very effective. I will be trying it out starting today. Thank you very much. Great! I’m glad you enjoyed it. Just remember to schedule the important things and everything else is secondary. Have a happy and productive life! Thanks for your article. I am not a very organized person at all at home, but I am at work. I can definitely use your information here to get my act together at home. Wonderful! I hope you give it a try and it helps. Interesting though… my coaching mind is really curious about why that is the case, i.e. that you are organized at work but not at home. Are you working too much? 🙂 Actually that is not unusual. I think it is service-oriented nature of humans to find it easier to do thing for others than to do for self. Thanks for commenting. Much success in your new organized home environment. Thanks for commenting Paula. I hope you give this a try to see if it will help you to at least get those important things accomplished. You are absolutely right that when tasks go undone, it creates unwanted stress. Great post. I have been working with this concept for many years and I really love it. Quad 2 is the one to work on in order to move you closer to your goals. WE often forget these thinsg because they lack urgency (e.g. networking etc.). I agree with you Juan. What really helps with Quad 2 is to have specific actionable tasks and not just a topic. Also, by having the time frame to complete within the week, it makes it a bit easier. Thanks for validating this method. Mind blowing! I am a very organized person, or at least I tend to think so, and this has been very useful. I use my iPhone for the most part when getting my week scheduled and or appointments but sometimes I fall short beaus there’s just not enough time in the day. This will allow me to organize my self and more importantly my priorities. Separating my personal task from my work task is such a great tool. Thanks for the insights! Angelic, you will find that classifying your tasks will indeed help to hone in on the important things. I’m glad this post was helpful. Thanks for commenting. 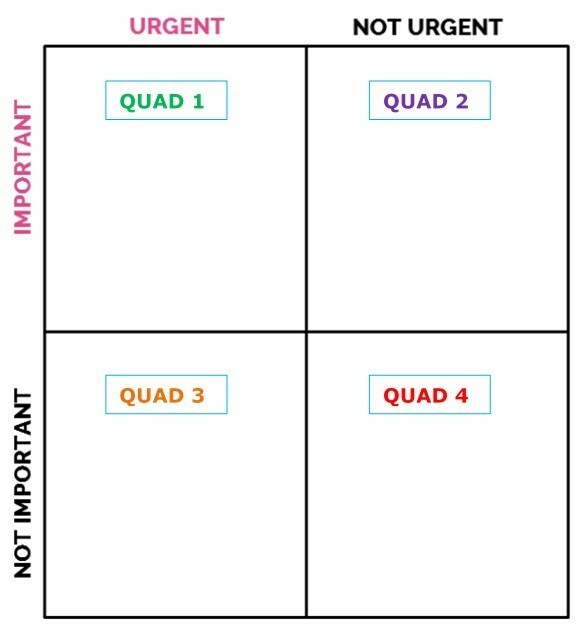 I can see that using the 4 quadrants would be helpful for me, it never occurred to me that there was a category: not important, not urgent. I have a tendency to get easily distracted, and I think this would help. I was loosely doing this in my head, but using the post it notes will make it more concrete. Judy, I think you will like the post it notes. 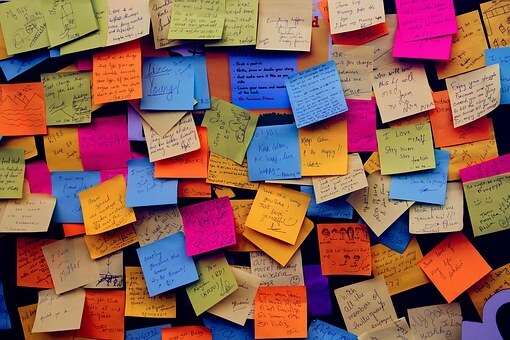 Getting things down on paper helps to declutter the mind, which in terms relieve stress. It will take getting use to classifying tasks as important or urgent; you will quickly learn that many things you do are not important at all. Thanks for commenting. Thank you so much for sharing such an informational post! I have three jobs, so time is not really a luxury that I can afford to waste. I am always looking for clever ways to keep myself more organized, so I can make sure that everything stays balanced. This seems like a terrific idea to keeping me on track and I will most certainly give it a try. Betsy, I really hope this method works out for you. With three jobs, it is even more critical to identify those important things to do first. Thanks for commenting. I am working on getting more organized and driven to achieve goals. This quad reminds me of another quad I have recently heard about. It had importance on one axis and time and effort required on the other. I think your quad may help me in my the daily plan, while the other might help organize a week long plan of action. Do you have any ideas on combining the two? I am a burgeoning onetrapeneur. Do you have any ideas of what to do with quad 3 if there is no one to delegate to? Great questions Kirk. This matrix is the same one you are referring to; it considers importance and urgency is the same as time. With regards with Quad 3, typically, people misinterpret Quad 3 and find it hard to delegate or overlook tasks that fall there. These are tasks that are usually interruptions, that you are doing for someone else anyway. They may be important to others and helpful for others, but not important for your goals. For example, someone stops by and asks you to take him or her to the store. So really, these are tasks that don’t get scheduled and if you choose to do them, just know you should not usurp your important tasks for the sake of accomplishing them. I hope this explanation is helpful and gives you a different perspective on evaluating those tasks. If you don’t delegate, you can choose not to do them, or consider if you have classified as not important and it should be classified as important? Let me know if I have clarified and feel free to respond. Thanks for commenting.